쿠스코, 페루의 호스탈 엘 트리운포 | 호스텔월드에서 예약하세요. In the center of the magical city of Cusco only half block from the Main Square is Hostal El Triunfo , behind the Cathedral, where you will find a warm welcome and will feel at home. We are near everything: restaurants, museums, art galleries, churches, discos, pubs, etc. 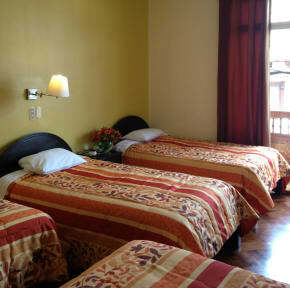 We have large, light and comfortable bedrooms with private bathroom, with hot and cold water all day long. TV cable and telephone, some of they have balconies to Triunfo Street; and all of them have beautiful views of the city. NEW:Hermetic doors in the balconies, they offer thermic isolation, they isolate the noise, raincoats without foundation, rain winds and dust. Breakfast is included: Coffe, tea, milk, bread, cake, butter,jam, cheese, yogurth,cereals, juice. Come and spend a few day around us, you will enjoy it. Finally we finished to expand and fix the new floor of the Hostal, we apologize for all the noise and inconvenience, hopefully soon come to know this new part of Hostal El Triunfo. Pick up from the airport S/.30.00 Nuevos soles for 1-3 people , email us your travel details.